An admirer of her photographs, I've mentioned Vivian Maier here a couple of times. I was surprised then, when my brother called me to say that he had read my blog; and more surprised when he told me that he knew Vivian when she was living in Wilmette Illinois in the early ‘80s. My brother was then the manager of the Wilmette movie theatre. 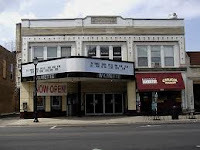 The theater was downtown in the aptly name Central Ave, and Vivian could be seen there from time to time – always with her camera. Having been a good friend of the previous manager, Vivian would occasionally stop at the theatre to chat.